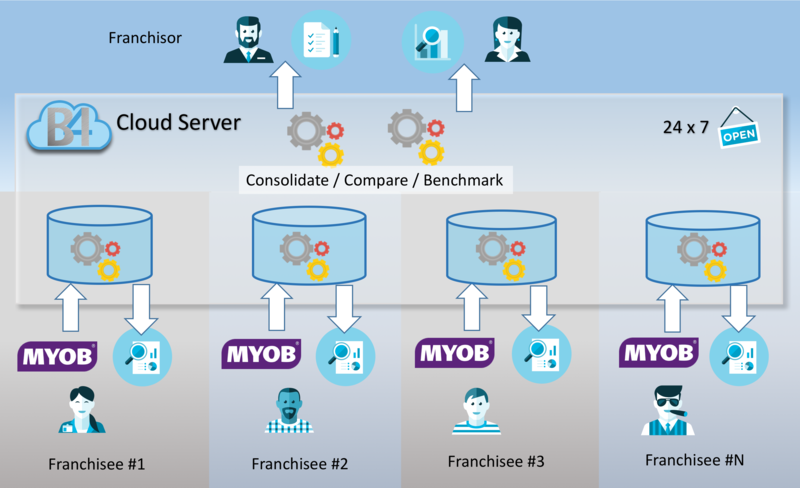 When a franchisor needs to crunch through the numbers to fathom which franchisee needs to be under the spotlight, use Bi4Cloud as the one reporting and charting tool that can dig into the detail and delivers top to bottom. 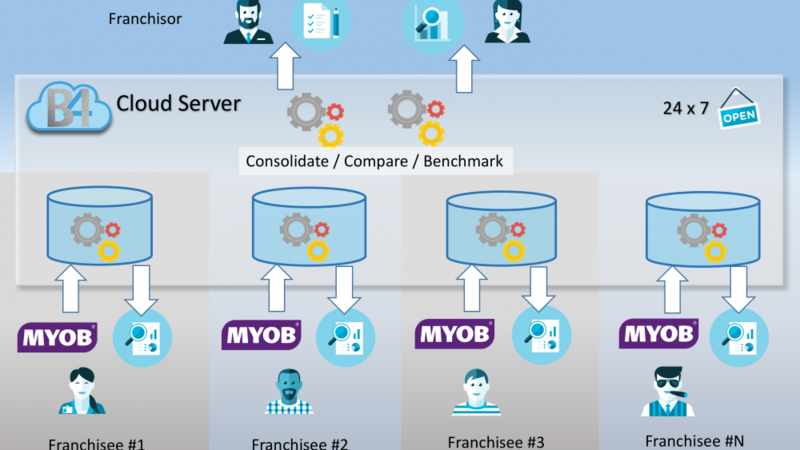 Cloud computing has propelled MYOB, Xero and Intuit-Quickbooks Online to deliver commoditised business software, which, because it is fully featured and inexpensive, allows small businesses, franchises and multi-unit groups to enjoy the cost and feature benefits of the standardised accounting suites. However these accounting systems do not have consolidation features so multi-unit reporting is provided by add-on solutions. These reporting add-ons incorporate graphical presentation however very few of them offer features to let users understand the cause of issues they identify. Few utilise the big-data technology and so they cannot analyse and drill down into transaction detail. In the absence of this detail, sufficient understanding cannot be obtained to effect actions and outcomes. Franchises are a successful business, cookie cut and repeated. They rely upon systems that assist in their success. Part of this are the reporting systems that monitor and manage the operations, including raising automatic alerts to keep on top of the business, delivered by email to tablet or phone, driving rapid and clear decisions to promote success and avoid mistakes. Off-the-shelf reporting solutions can be employed to provide comparative and consolidated dashboards, plus various Key Performance Indicator (KPI) panels, and Financial reporting and are often pre-configured. Choosing the right solution that can show the whole picture will provide the best value and the fastest insight to action. In the article Graham segues to the role of Analysis and introduces Business Intelligence (BI) systems as a way to capture more than just General Ledger data. BI digs deeper collecting data from other areas and modules like Sales and Purchasing transactions. With BI systems you can explore the detail. You can analyse activity in intervals of days, weeks, months, quarters and years. You can perform seasonal comparisons. You can select your dimensions and answer your question. Equipped with detail you can understand and take control. BI systems that capture data down to detail can be used to summarise for simplicity and analyse for necessity. A BI system provides benefits to both the franchisor and franchisee and services both their common and disparate needs. BI4Cloud – Business Intelligence for Cloud – extracts data down to transaction level and delivers multi-dimensional Business Intelligence to the masses. Now everyone can fly. 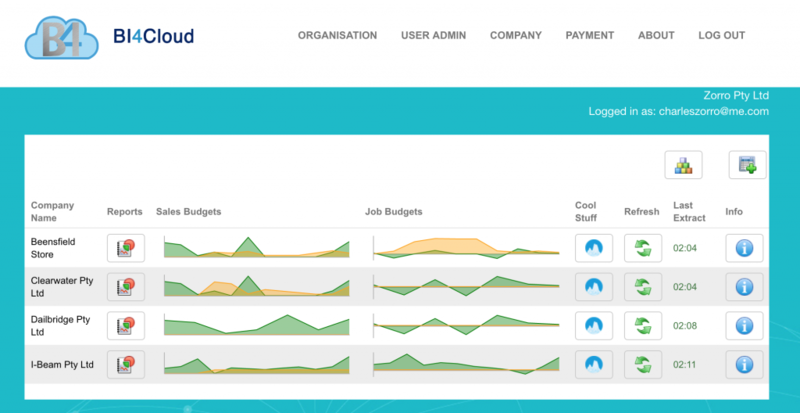 With its simple browser based analysis capability and it’s included ready to run charts and reports delivered by Cloud computing, BI4Cloud gives you transaction level detail across single and multiple franchisees to slice, dice, subtotal, drill down and save as your own favourite. All data including Accounts, Sales and Purchases is made available from summary to absolute detail with graphical and tabular presentation. BI4Cloud is one tool, in one place, for all that matters.